I must be more ready for fall than I'd like to admit because I have been craving soup for the last few weeks. So this weekend, I pulled out the giant stock pot and made some very yummy soup. If you make one soup this fall, this really should be it! It's a slightly spicy chicken noodle soup and definitely worth the effort. 8. 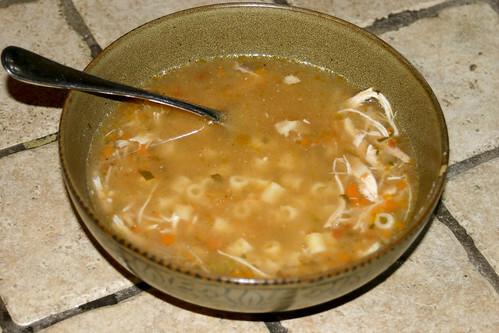 When soup is finished, remove chicken pieces with a slotted spoon and set aside to cool. 9. Remove vegetables with a slotted spoon and place in blender. With the pulse function, chop the veggies to very small pieces. Add back into broth. 10. When chicken has cooled enough to handle, remove skin and bones and return meat to soup. 11. Notes: Soup is best when served the next day. Refrigerate and remove fat that collects at the top. Serve soup with small stubby pasta such as ditalini. Add freshly grated Parmesan or Romano cheese. This makes a lot, so be prepared to eat if for every meal for the next week, have a lot of people over or freeze some.